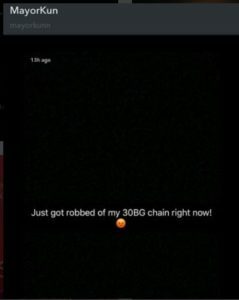 Singer, Mayorkun has revealed via a Snapchat post that he has been robbed of his 30 Billion Gang neck chain. It is being reported that the singer lost the luxurious item while performing at a show in Enugu. The neck chain is rumored to be unimaginably expensive especially because it is one of the luxury items that comes with signing up with Davido’s record label, DMW.